Measuring between 3 and 4 feet long and weighing between 100 and 150 pounds, capybaras (Hydrochoerus hydrochaeris) are the largest rodents in the world. They can be found across South America, from Brazil down to Argentina, and west into the Andes. They'll only live in areas where they have easy access to water, such as flooded grasslands and marshes. A range of adaptations aid their survival. As semi-aquatic creatures, capybaras have certain adaptations that allow them to spend more time in the water. Their eyes, ears and nostrils are all positioned high up on their heads. This allows them to almost completely submerge themselves in the water, while still being able to breathe, see, hear and smell. They're also able to press their outer ears extremely close to their heads, which effectively closes up their ears to avoid getting water in them while they're submerged. 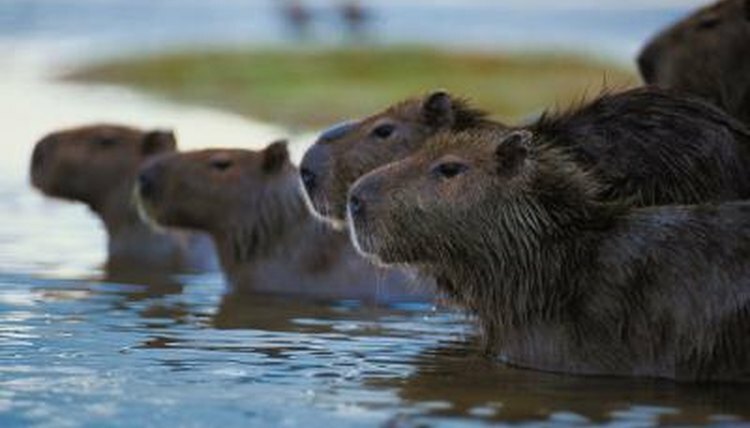 Capybaras are strong swimmers. Their long hind legs and partially webbed feet help them to effortlessly propel themselves through the water. These webbed feet also help them on land to avoid sinking into the mud when walking on wetter ground. Their bodies are only slightly denser than water, which allows them to stay afloat more easily. Although they do need to come up to breathe eventually, they're capable of spending a full five minutes completely underwater. Since capybaras live in hot climates, they've had to adapt to deal with high temperatures. These creatures are sensitive to the heat and prone to getting sunburned, so they're mostly active in the early mornings, evenings and at night. During the hottest parts of the day, they retreat to the water where they relax and wallow until it's cool enough to come out. During the dry season, when water is more scarce, they may be found wallowing in large groups of 100 or more members. Several adaptations help capybaras avoid predation. They're always on the lookout for danger and, when a herd member spots a potential threat, he makes barking noises to warn the rest of the group. They're able to run quite quickly over land, but will immediately dash to the nearest water source to get away from predators. Once in the water, they'll either speedily swim away, submerge themselves completely underwater or hide themselves amongst floating vegetation to avoid detection.